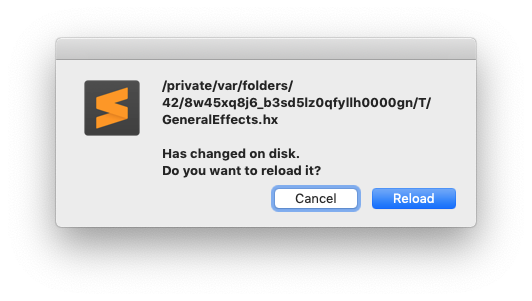 Every time you save a code behavior from Sublime Text and then save in Stencyl (usually when compiling), the next time you start typing in Sublime Text, it will pop up a dialog warning you of a detected change to the file. This is pretty annoying. I can't think of a reason why the temporary file would have to be modified when no changes have been made on Stencyl's side to the code behavior. Actually, it seems like saving in Stencyl isn't even required: just saving in Sublime Text will trigger it. Does Stencyl modify the file after detecting that the file changed?